Traced switch location on instrument panel. Cut out and filed holes to final size. Using Otto industrial sealed rocker switches. When they are on a green LED illuminates on the switch. Finished torquing remaining fuel fittings. Fabricated SSC ground wire. Machine countersinked instrument panel and radio tray brackets. Spent most of the day rerouting wires. Main power wires will now go along left and right side bulkheads. All aft wiring going forward will be through floor conduit, in theory at least. Match drilled canopy micro switch to mount and latch block and primed switch mount. Match drilled ground block and installed to instrument sub panel. Began torquing fuel valve flare nuts. Space is severely limited so I had to undo 4 lines to make space for the wrench. The tight space and limited visibility make torquing almost impossible on the two outboard flare nuts. Nothing like working by reflection in a mirror! I was able to get them all torqued but dread ever having to remove the valve. Match drilled baggage door micro switch to latch block holes and mount. Primed and bolted parts together. Sanded baggage door latch rod for proper micro switch engagement. Mounted SSC to base. I went with a 100 amp SSC instead of a relay or battery contactor due to the low on power draw of 6ma, over current trip, and low operating voltage. This will give me circuit protection as well as longer endurance on battery #2 power. Battery #1 will be used for engine start and therefore is controlled with a conventional B&C battery contactor. Installed GSU mount bolts and adjusted unit to manual specs. The install manual requires that the connectors be aligned within 1°of either the longitudinal or lateral axis. Mounting to the sub panel should be sufficient. Match drilled baggage shelf cover to stiffeners and installed nutplates on sub panel. Mounted LRU’s to avionics shelf. 1. I did not want a cross tie or an E bus alternate feed. I have two hot busses and Garmin dual feed avionics. Altenator feeds both batteries. This provides a simple solution with with over current and reverse current protection. If the altenator dies or a short the system splits in two due to the diode. Nice and easy, load shead and land. The cool part is I can turn off the battery’s and the engine will still run! 2. This is a mosfet gate so the forward voltage drop is around 0.2 V at 100 amps which is way beyond normal system draw. I am running lithium batteries and with a schottky diode the voltage drop will not allow full charging. Since I am running an electrically dependent engine this is a must. 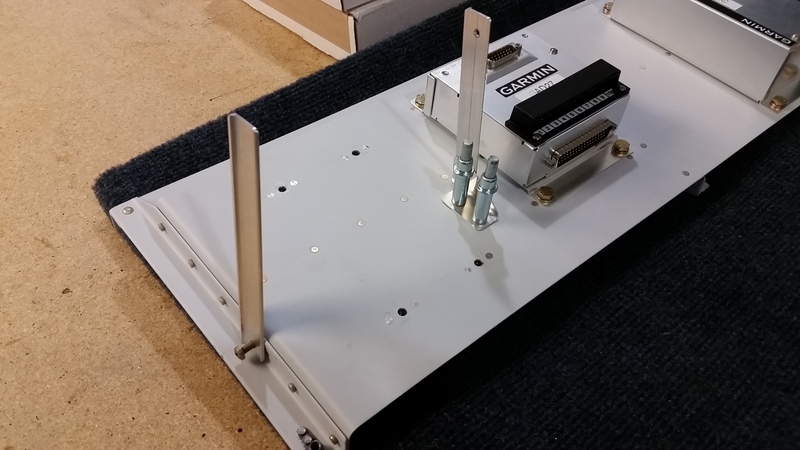 Drilled SSC heat sink plate and riveted to bus mount. Drilled and installed avioncs shelf nutplates for power gate. Installed wire cradles on cross brace and avionics shelf. Final drilled and installed GTR tray supports. Drilled instrument sub panel for micro switch. Floxed ends of bsggage and canopy latch pins. Need a solid surface fir micro switch engagement. Primed radio tray brackets. Finished radio rack bracket fabrication.